Ah, Steph. Isn’t it just the way it goes? While you’re over there and Heavenly Father is sending you reassurance and extra joy in the beginning of the school year… I’m seeking a signal from the divine that I *AM* supposed to homeschool. Because the curriculum is bought. I just have to hit “send” on the little “NOTICE OF INTENT TO HOMESCHOOL” form. But I digress. For backtalking, we are using a teaspoon of vinegar. It’s had surprisingly good results. And I’m sure that’s the most pathetic answer you’re going to get, so now I’ll just sit back and wait for all the actual good advice to come in. PS–I love Shaun the Sheep. Lots. The End. We LOVE Shaun the Sheep around here! The best thing I’ve found (until it stops working, which could happen tomorrow) to curb backtalking is to reply calmly with “Please try that again.” If they have a second sassy comment I add a consequence–“You’ve lost computer privileges, and please try that again.” And again, “Now you’ve lost computer and friend privileges, and please try that again.” My hardest but most effective trick is to say it completely calmly. I know they know when they’re being sassy, so I don’t like to have a drawn out explanation/reasoning session each time. But I can grit my teeth, and tell them to try again. My problem would be remembering what each child lost! I’m a pretty firm believer in time out. But I don’t say they have to be there for a certain amount of time. They are in there until they are ready to change their attitude and behavior, and they have to come out with a plan. If they don’t have a (good, workable) plan, or if they are obviously not ready, they have to go back. This process usually makes a huge difference when I am calm and unrelenting. That said, sassy comments are not totally eradicated from my home. I wish I knew how to do that! And I totally feel for you about the 3 schools thing. We always seem to have two (it’s usually been preschool/elementary but now it’s elementary/middle) and that’s hard enough! Good luck! This was so going to be my quandry. And now they get bussed. Wait, no 4 times daily because they’re on different schedules. My kids are in two different schools, but they are on opposite sides of town, so I feel like I’m driving ALL the time. Except, my husband takes them to school in the morning, so really I just have to make the rounds in the afternoon. I do have a friend that splits pick up duty with me… she goes to one school, and I the other, two days a week, so that helps. Know what I did to simplify this year? (I have three that are in school… a 5th grader, and 2 2nd graders) We decided to say no to extracurriculars. Not entirely… they are each allowed to pick one sport each, which lucky for us will probably be basketball all around. It’s a brief, eight weeks of intensity, then it’s over. Other than that… we’ve decided to minimize as much as possible. I just said to my husband the other day… just because they aren’t in a lot of extracurricular stuff outside the home, doesn’t mean they can’t enjoy a lot of extracurricular activities INSIDE the home. I’m teaching them all how to play the piano. They all work in the garden. We go swimming together twice a week… I’d say they’re lives are plenty enriched enough without me having to drive all over the county for soccer and gymnastics and karate and what have you. Now, I know my kids are still young and there will come a time when they will have personal passions that are strong enough that our family will prioritize involvement in certain things so that dreams can be fulfilled and all that stuff… but right now? I really just want my life to be as simple as possible. I think the easiest way to juggle multiple children is to make them as RESPONSIBLE as possible for as MUCH as possible. I expect a lot out of them, but lemme tell ya – it makes my life a TON easier. I love our Montessori. If the kids don’t do their homework, they nap in the afternoon. They used to miss recess, but the effect of that wore off too quickly. If they are late, they miss part of recess. Unfortunately, since we drive, if one is late, all three are late. We have to come up with an extra bad chore at home when one child creates negative consequences at school for the others. I do believe strongly in natural consequences and letting them suffer them if their choices ask for it. . Since our children only get one mom (for the most part), by default that makes us their worst mom ever. But it also means we’re their best mom ever too! P.S. Elder Holland gave a great talk on bridling your tongue in the April 2007 general conference. At least for older children, teaching principles works great. My kids were deamons and I honestly thought Heavenly Father must have sent the answer to the wrong family! As we learned how to interact with eachother without the school time looming, fighting decreased (didn’t disappear), timeouts decreased, Enjoyment of family increased, my patience increased…and more. I second that! Homeschooling has been an absolute miracle for our family. We are happier than ever (including Mom!) – counterintuitive, I know, but the Lord knew what he was doing with that prompting! My seven-year-old recently screamed at me that I was ruining her life and she just wanted to go far, far away from me. Forever. Knife in heart – twisted. Such fun. As far as school goes, my only piece of advice is: Do everything you can the night before. Nothing else helps as much as that. And as far as back talk goes, I find that with my strong-minded girls, the only thing that works is to be calm in face of their lack of calm, and send them to their room. I make a comment along the lines of, “You’re welcome to come out when you remember how to talk nice.” Or, “If you’re that cranky you MUST be tired. Maybe after you have a rest you’ll remember how to have a good attitude.” It’s fairly effective. Most days. Hi think your post was fun and the comments, hilarious. I don’t have any pearls of great wisdom to throw at you, but I have one child who’s very, very sassy indeed. I have the biggest problem getting her to understand; we’ve tried all the ‘losing privileges’ stunts, and they don’t work on her, because she can be very pigheaded and say ‘I don’t care.’ Then I got one of those inspired moments, where I actually got a thought that kinda made sense. You said that their responses “might trickle over into other relationships with teachers or other adults.” I thought the same way until I realized that our children need to be able to get out of bad situations fast. We can’t raise sheep anymore. Please don’t take what I’m saying the wrong way, but there are plenty of adults out there that have power over our children, and we’re not there to protect them all the time. They need the skills to shout, run, fight and more, if the need rises. I just hope that my daughter can make herself more assertive with others, not just me. And I have zero brilliant advice about the school situation. Count your blessings that you aren’t scrambling to find your sun a good school, like you were last year? And make yourself a rockin’ mix CD of songs for school pick-ups and drop-offs. So glad the kids are going back to school! Yee-haw, people! I thankfully only have 3 kids at 3 schools, but the two older ones are in jr. and high school, so they don’t count. 2 years ago I had 3 little kids in 3 schools. This year they are all in the same one. We do lunch the night before. I go to the dollar store and buy a lot of the stuff–raisin packets, cracker packets, applesauce, pretzel sticks and cheese. (our school doesn’t allow anything with sugar in it…makes it fun to find something for lunch!) That saves me in the morning. We also have created a morning chart that has everything they need to do…get up, get dressed, do hair, shoes and socks, breakfast, leave on time. Those who do well at the end of the week get a surprise. “Well” is determined by MOM. It might be so many points or a percentage of good marks. Setting clothes out the night before and KNOWING where all the shoes are the night before pays off big. Of course, at my house, THEY have to pick out the clothes because they won’t wear it, usually, if I do the picking. When I got told I was the meanest mom in the world, I threw my hands up in the air and said, “woo hoo, I finally made it!” He kept trying to tell me, “not the nicest, the meanest.” My response was the same. He stopped pretty quickly when he got an off the wall response. My son is going into grade 1 and my daughter into kindergarten, both will be in school 5 days a week, full days; luckily at the same school. 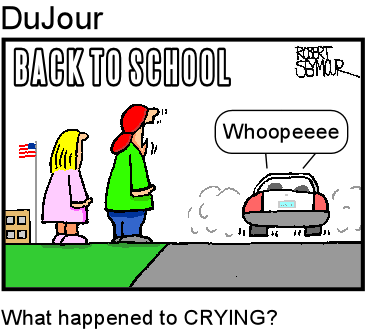 I was beyond done with summer holidays when the halfway point hit, we still have another 3 weeks until school starts! I am keeping the day’s as busy as I can to help speed that time along! I too have had so very many of those moments of being screamed at, talked back to, told I hate you and I want a new mommy. I love the advice given by so many other mom’s! I remember the “wash your mouth out with soap” punishment, oh how it worked for me and my siblings. We have been using timeouts and taking away privileges to curb the back talk, but I admit some days it does feel like we are going a million-miles an hour backwards with it. I am thinking moving to using hot sauce or vinegar would be a whole lot more effective. Aw, Stephanie, I totally agree with you… if they didn’t turn into demons right about now, we’d want them home with us all day everyday for the rest of our lives!! I think it’s kind of the same concept with getting so completely tired of being pregnant and not being able to sleep and move and do anything with that large basketball in front of you that you’re willing to go through labor just to not be pregnant anymore…. yeah? maybe. The sass and back-talking thing. WOW! We have had our share with 13, 10, 7, and 3 year old. Mostly the 7 and 3 year olds!! We’ve tried time-outs, we’ve tried taking away privileges, but the best thing so far (and yes, I’m afraid to say I just figured it out this year) is to charge them money. A “quarter per sass” hee hee, depending on the situation. If they argue that? It doubles! The little ones might not get it right away (We usually still do time-outs with Beck), but the older ones? They’ve shaped up QUICK!!! The 3 schools, 3 schedules, and all that? Oh man…. I don’t know. It sounds like a rough year ahead, but I know you can do it. I always try to look at what I can and cannot change. You need to be there for your kids, hopefully you can set up some carpools IF that helps. Sometimes carpools are more work for you because you have to juggle it not to have to be in two or more places at once. I would say make sure and take time just for you (each day if possible) to recharge and maintain a sense of balance. Also, don’t volunteer for anything “extra” — you’ve got enough on your plate. Our family rule is “if nothing sweet comes out, nothing sweet goes in.” (Thank you Love and Logic.) So if the kids are sassy, rude, namecalling, etc. – then they miss out on dessert that day. I don’t tell them in the moment. I wait until I dish up the cake/cookies, then say something along the lines of “oh, that’s so sad that you don’t get any tonight. I’m sure you’ll do better tomorrow.” The trick is saying it with a sympathetic (not sarcastic) voice. It’s amazing how quickly they learn to watch what comes out of their mouths. 🙂 Oh, and I should add – we don’t have desserts every day, maybe twice a week. But if the kids have been really bad that day, you’d better believe I whip up a batch of cookies and eat them in plain view. 🙂 Good luck with back-to-school season!